The Fintie Silicone Cover is a 100% silicone case that envelopes the back of your device while projecting a raised lip for lay-on-the-table design for your screen. Available in a variety of bright, fun colors, the tactile side grip feature helps you get a grip on your iPad tablet. Not compatible with iPad Pro 9.7 Inch 2016 Release tablet or any other iPad tablets. Made of premium childproof silicone, absorb the shock your device may receive from any accidental drops or bumps. Unique corner protection with perforated shock absorber design to protect from extreme shock and impact. The raised bezels protect your screen and camera from contact with flat surfaces. The anti-slip silicone design is made for easy grasping so that your child may be less likely to drop the tablet on the go. The interior pattern helps keep the device cool by directing heat outside through the open port holes like the camera and speaker openings. 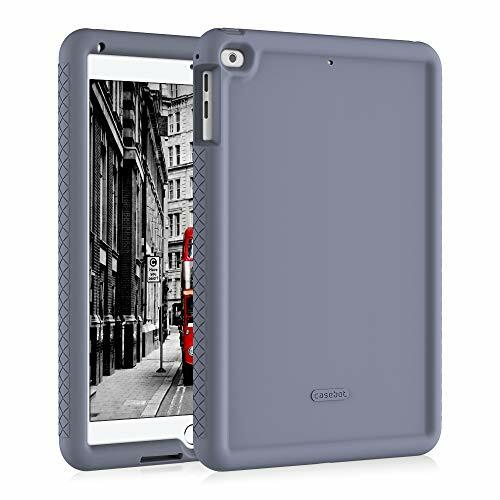 Made of durable impact-resistant silicone, provides shock absorption for all edges and especially corners, while maintaining a smooth, clean look.